Car number 1-50, 51-100 below, 101-150, 151-208. This family crew started badly dropping an hour and a half on the seeding stage, apparently with a collaspeed wheel bearing, and then skipping the Heywood special stage. They persevered to Adelaide taking maximum penalties at Bordertown and then skipping the Sunset Country. With major car dramas they left Adelaide late and drove directly to Perth missing 25 controls. 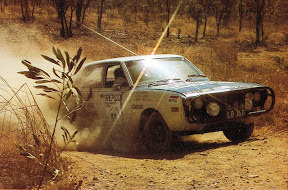 They again left Perth late but only did the stages as far as Meekatharra before skipping to Darwin, albeit picking up a few controls along the way. They skipped the entire division to Townsville. After doing one competitive to Mackay they skipped to Sydney, again picking up some controls along the way. After missing most of the final night they had missed a total of 72 controls and were classified as finishing 83rd. After placing 29th on the seeding stage, this experienced crew lost over an hour in the Bordertown bog , placing 26th into Adelaide. They dropped to 33rd at Broken Hill after a careful run and despite losing almost an hour at Marree and more time in the sand to Immarna, they climbed to 29th. After losing close to 2 hour into the Nullarbor Roadhouse they skipped to Coolgardie, dropping 2 controls. They left Perth late and skipped to Geraldton, and skipped two more competitive stages before Darwin. After skipping to Mount Isa they completed the rest of the division to Townsville. They had a good run down the east coast placing 12th on the dvision to Sydney and 10th on the final division. They were classified as finishing 24th with 8 controls missed. 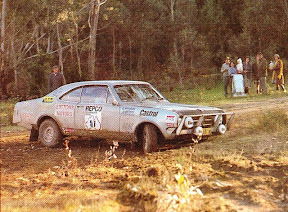 Meehan was an experienced campaigner, showing good form with a 20th on the seeding stage but then hit a fence post on the Tarpeena stage north of Mt Gambier. 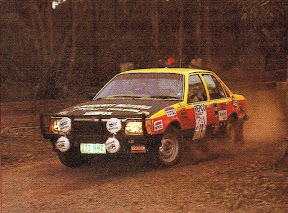 They subsequently lost almost an hour in the Sunset Country and placed 31st into Adelaide. It all fell apart in Adelaide and they were forced to skip most of the division to Perth, dropping 16 controls. In WA they had a torrid run with a sick crew member and considerable fatigue. 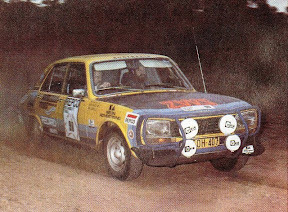 They damaged the front suspension (probably on teh Rabbit Run stage) then skipped the stages between Newman and Derby, dropping a further 7 controls by Darwin. Then they skipped directly to Mount Isa due to lack of brakes and did a few more stages before Cairns, dropping a further 9 controls by Townsville. They were late leaving Townsville, missing a further 2 controls but then had a reasonable run down the east coast. They placed 41st on the final division and were placed 53rd outright missing 34 controls. An experienced crew that were often quick, placing 11th on the seeding stage. They had a good run through to Bordertown but lost an hour with mechanical issues and another hour in the Sunset Country, placing 45th into Adelaide. 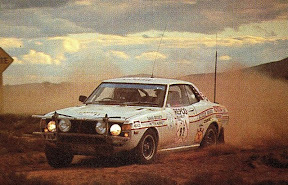 They climbed to 31st by Coober Pedy but needed extra service time at Kingoonya then got stuck in the sand enroute to Immarna dropping to 38th. Presumably punctures prevented them from reaching the Nullarbor Roadhouse within late time and they subsequently cut to Coolgardie, dropping 5 controls. Having left Perth almost an hour late they had a difficult run through WA but managed to drop no more controls, placing 24th on the division. 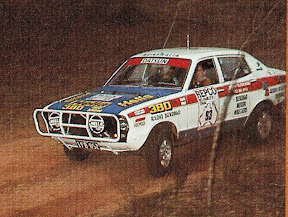 They placed 25th on the division to Townsville despite dropping over 3 hours on the stage to Burketown. On the run down the east coast, mechanical problems continued and they skipped the horror stage north of Rocky but did not drop a control. They placed 38th on the division to Sydney and were 37th on the final division. They were classified as finishing 20th outright. After placing 54th on the seeding stage, this SA crew struck problems north of Mt Gambier and skipped to Bordertown, dropping 2 controls but missing the bog. They lost nearly an hour in the Sunset Country but otherwise reached Adelaide unscathed. They had a good run through SA despite some significant time losses in the sand to Immarna and with punctures to Nullarbor Roadhouse but then skipped directly to Perth missing 11 controls. Despite an hour lost at Geraldton, they had a pretty good run through WA until Port Hedland where they struck problems and skipped to Darwin dropping 6 more controls. They may have been out of late time at Darwin but in any case, they retired there. 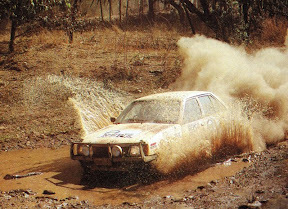 The Bathurst crew struck trouble on the seeding stage, apparently caused by dirty fuel, placing 129th which put them well down the field. They did well to drop only 45 minutes in the Bordertown bog and 50 minutes in the Sunset Country, climbing to 47th by Adelaide. They had a great run through SA to Immarma climbing to 30th but then lost time with punctures at the Nullarbor Roadhouse. They skipped the Rawlinna stage missing 2 controls to Perth. They placed 19th on the stage to Darwin after a pretty good run through WA. They skipped the Roper Bar stage dropping 1 control but otherwise had a good run to Townsville. 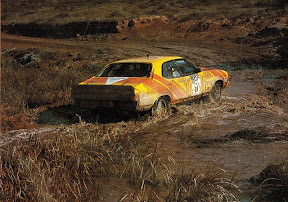 They had a good run down the east coast despite skipping the Horseshoe Forest Road stage but did not drop a control. They placed 22nd on the final division and were classified as finishing 16th outright with 3 controls missed. After placing 73rd on the seeding stage, this two man crew lost over an hour in both the Bordertown bog and the Sunset Country, placing 55th into Adelaide. They climbed to 45th by Broken Hill but lost over an hour into Blinman and skipped to Nullarbor Roadhouse missing 5 controls. 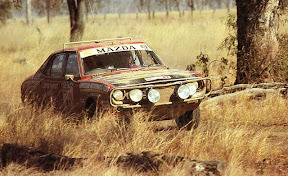 They then completed the route to Perth OK but left Perth very late, skipping to Newman but only did a couple of stages before skipping to Darwin. They missed most of the division to Townsville but seem to have done the stage across to Burketown. They did the route down to the NSW border but then skipped to Sydney. They placed 36th on the final division and were classified 58th outright missing 39 controls. 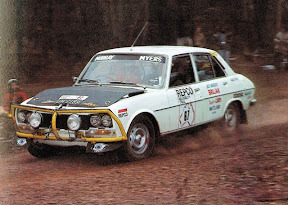 This car was the one used by Evan Green in the World Cup Rally, and should have been quick. 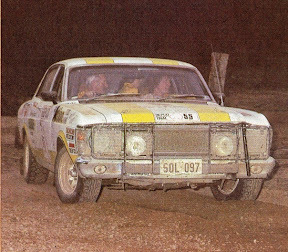 Moore was a circuit racer and the crew had very little rally experience. They were slow from the start, 60th on the seeding stage, and did not complete the Sunset Country within late time, dropping 1 control to Adelaide. They broke the suspension enroute to Broken Hill and retired. An experienced crew who placed 29th on the seeding stage but then struck trouble on the Heywood special stage losing crucial road position. 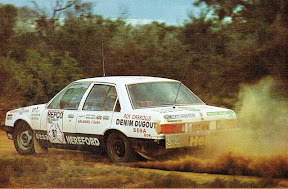 They then lost two and half hours in the Bordertown bog and maximum time in the Sunset Country, placing 65th into Adelaide. A good run through SA saw them up to 42nd by Immarna, but problems on the Nullarbor saw them skip 4 stages and miss 3 controls to Perth. 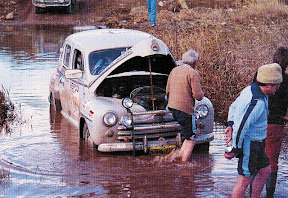 They had a difficult run through WA but did not miss any controls, despite losing time on the Gibb River Road when they were the first car to arrive on the scene of the fatal accident. They placed 21st on the divison to Darwin. Despite leaving Darwin late and dropping over an hour enroute to Burketown, they placed 21st on the division to Townsville. They had a reasonable run down the east coast placing 27th on the division to Sydney and 26th on the final division. They placed 17th outright with just the 3 controls missed. One of several historic vehicles in the Repco, this one had completed three previous round Australia trials including the 1953 Reddex. It was pretty slow, 115th on the seeding stage, but a determined effort saw then place 77th into Adelaide after skipping the Sunset Country but not dropping a control. They struck problems in the Flinders Ranges and skipped to Broken Hill for repairs but then went straight to Kingoonya the next day. After dropping more than 3 hours to Immarna and another 3 hours to the Nullarbor Roadhouse, they headed straight for Perth having dropped 15 controls. They continued to Meekatharra but then they hit a kangaroo and after effecting repairs skipped to Darwin, dropping 11 more controls. But they had burnt out a valve and had to replace it before leaving Darwin, so skipped most of the division to Townsville dropping 18 controls. Webber apparently retired in Townsville but the father and son continued. A big end bearing started to fail by Brisbane and they changed the crankshaft in Coffs Harbour, dropping a further 11 controls on the division to Sydney. They only missed 3 controls on the final division and were classified as finishing 75th with 59 controls missed. Veterans of many round Australia trials, this two man crew placed 61st on the seeding stage. Despite losing more than an hour in the Bordertown bog, they placed 39th into Adelaide. They broke the suspension in the Flinders Ranges and retired at Broken Hill. After placing 42nd on the seeding stage, this two man crew took maximum penalties in the Bordertown bog and the Sunset Country to place 72nd into Adelaide. However they left Adelaide a day late and headed for Kingoonya where they dropped over 2 hours to Immarna and 2 more hours to Nullarbor Roadhouse, then skipped to Rawlinna stage so dropping 10 controls to Perth. They apparently broke the rear end somewhere after in WA and retired. 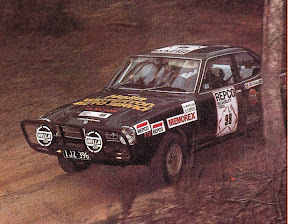 Carter was an experienced circuit racer but the crew had limited rallying experience. They struck problems from the start, placing 142nd on the seeding stage and then losing a lot more time north of Mt Gambier, including maximum penalties in the Bordertown bog and the Sunset Country. They were placed 81st at Adelaide but skipped directly to Broken Hill. They exceeded late time at Marree but continued through to Perth where they were excluded. 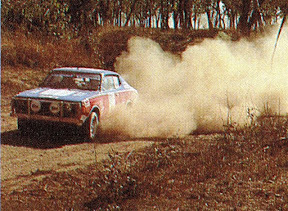 They continued under protest but only did a couple of competitive stages to Darwin, including the Gibb River Road. 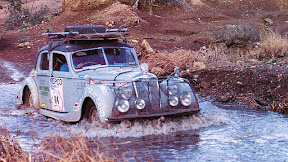 They did about three stages on the division to Townsville, including dropping more than 3 hours at the Norman River. They only did three stages on the division to Sydney and one stage on the final division. An experienced crew from North Queensland with strong backing from their club, placed 37th on the seeding stage. Despite dropping half an hour in the Bordertown bog they placed 24th into Adelaide. 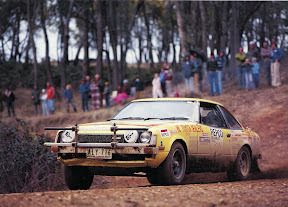 They lost half an hour on the Frome Downs stage and then an hour and a half to Marree. Despite another hour lost in the sand to Immarna they were up to 32nd. Despite several hours lost on the Nullarbor with punctures, they dropped no controls and placed 25th into Perth. 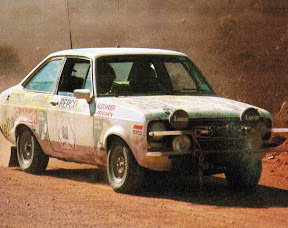 They left Perth half an hour late and by Meekatharra they needed a replacement diff and skipped most of the stages through to Port Hedland, but cleverly only dropped 3 controls to Darwin. They did one stage out of Darwin then headed for Borroloola but clouted a horse and headed for Mt Isa, dropping 4 more controls. They completed the route from Mt Isa to Townsville. Despite a few problems they completed the division to Sydney in 35th place and were 27th on the final division. They were classified as finishing 23rd with 7 controls missed. Another historic vehicle, driven by Gelignite Jack Murray in two previous round Australia trials, it was always going to be a case of a steady run to keep the old girl together. 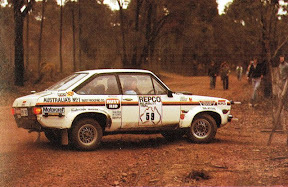 From 114th on the seeding stage, a steady run and once mised passage control saw them in 68th place into Adelaide. They did no competitive stages until the final run into Perth but managed to drop only 11 controls. Similalrly, in WA it was acase of just following the highway with no competitive stages completed and 16 more controls missed. After Darwin the results are missing but supposedly they retired towards Sydney with a broken crankshaft. This Gold Coast crew started poorly placing 87th on the seeding stage and despite more than an hour lost at Bordertown and in the Sunset Country, they placed 37th into Adelaide. They lost an hour and half leaving Adelaide and another hour on the first trial stage then skipped directly to Broken Hill. They then skipped Coober Pedy, lost time on the Nullarbor and skipped over the Rawlinna stage, but skilfully only missing 4 controls to Perth. Despite leaving Perth almost 2 hours late they perservered through WA to miss no further controls to Darwin. On the dvision to Townsville they skipped all the competition from Borroloola to Cairns, dropping 13 controls. They had a good run down the east coast placing 15th on the division to Sydney and 17th on the final division. They were classified as finishing 33rd with 17 controls missed. Experienced in long distance events, this crew placed 65th on the seeding stage and almost 2 hours on the Tarpeena trial stage before taking a maximum penalty on the Bordertown bog and the Sunset Country. They perservered into Adelaide in 80th place. Their problems continued with large time losses on most stages to Marree where they skipepd to Nullarbor Roadhouse, then they skipped the stage after Coolgardie missing a total of 7 controls to Perth. After leaving Perth late then headed straight to Meekatharra, did a few more stages before skipping to Derby. 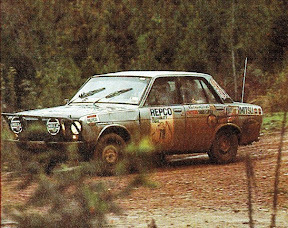 They took a maximum on the Gibb River stage when they remained at the scene of the fatal accident for many hours, receiving the organiser's sportsmanship award. They had missed 8 more controls to Darwin and despite skipping a few stages they only dropped one more control to Townsville. They had a better run down the east coast placing 23rd on both divisions and being classified 32nd outright with 16 controls missed. 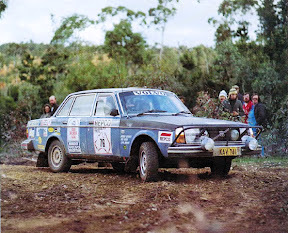 The all girl Volvo team placed 45th on the seeding stage but then lost 2 hours in the Bordertown bog and skipped the Sunset Cpoountry, dropping 1 control to Adelaide. They had a good run through SA until losing more than 3 hours with punctures into the Nullabor Roadhouse, then skipped the Rawlinna stage dropping 2 more controls to Perth. A good run through WA saw them place 20th on the division to Darwin. After Darwin they skipped directly to Borroloola, dropping 2 controls, then lost over 2 hour enroute to Burketown. They took extra service time in Mt Isa and skipped the Norman River stage to Croydon but without missing any more controls to Townsville. They had a reasonable run down the east coast placing 29th on the division to Sydney and 18th on the final division. They were classified as finishing 19th outright with 5 controls missed and easily won the Ladies Award. 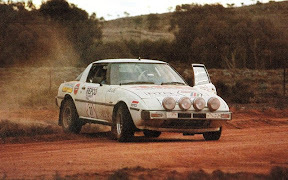 After placing 36th on the seeding stage, this two man crew from central Qld in the beautiful RX7 dropped a few positions on the road and then lost an hour at the Bordertown bog and some more time in the Sunset Country. They placed 38th into Adelaide. A reasonable run to Broken Hill was hampered by almost running out of fuel then they lost almost an hour at Marree and likewise in the sand to Immarna, by which time they were up to 34th. A relatively good run across the Nullarbour saw them climb to 23rd at Perth. Unfortunately they retired with a broken rear suspension somewhere in WA. The big P76 placed 56th on the seeding stage but lost almost an hour and crucial road position on the Ballarat stage. They subsequently lost an hour and 40 minutes in the Bordertown bog and an hour in the Sunset Country before placing 64th into Adelaide. They left Adelaide quite late and skipped to Yunta then up to Frome Downs, missing Broken Hill, but from Marree they skipped directly to Nullarbor Roadhouse then picked up a few controls on the way to Perth, missing a total of 8 controls. In WA they skipped the stages after Meekatharra and the stage after Port Hedland, but cleverly only dropped one more control to Darwin. They ran into trouble enroute to Burketown and subsequently cut and ran to Townsville, missing 13 controls. They left Townsville late, missing the first stage and 2 controls, but missed no more controls through to Sydney despite skipping the Horseshoe Forest Road stage. They placed 51st on the final division and were classified 43rd overall with 29 (or maybe 24) controls missed. After placing 100th on the seeding stage, this Melbourne crew lost time in Ballarat and then short cut the Heywood special stage. With poor road position they lost over 2 hours in the Bordertown bog and skipped the Sunset Country, dropping a control. They were an hour late neaving Adelaide but perservered through to Kingoonya where they cut and ran to Perth missing 13 controls. 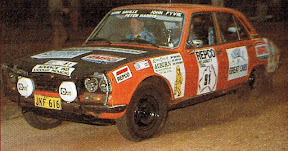 They did only two trial stages up to Port Hedland but cleverly only dropped 4 controls, then completed the route to Darwin. They missed another 13 controls to Townsville, only doing the route from Borroloola to Mt Isa. They did the whole division to Sydney, placing 26th, but skipped much of the final disivison, missing another 7 controls. They were classified as finishing 57th with 38 controls missed. 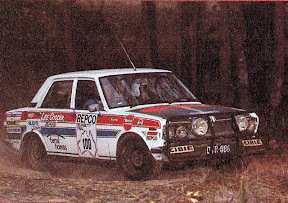 This experienced Geelong based crew placed 21st on the seeding stage but had dropped to 32nd by Mt Gambier after a slow run on the Heywood stage. They had a reasonable run north from Mt Gambier and survived the Bordertown bog only drop a handful of minutes. Sadly, their good run ended at Pinnaroo with reported engine problems, although Tuckey's book suggested it was brake problems. They limped into Adelaide missing 7 controls but supposedly did not continu, although Tuckey suggests their engine problems appeared after Adelaide, and that is was repaired in Port Augusta only to fail again at Tarcoola. This experienced and well prepared crew placed 15th on the seeding stage and basically held that position through to Adelaide despite losing some time in the Bordertown bog. A steady run through SA saw them 13th at Immarna. They had a series of punctures and a slow run across the Nullarbor, but held 13th into Perth. A generally clean run through WA was only hampered by a slow run through the Nunyerry stage and getting bogged before Port Hedland. 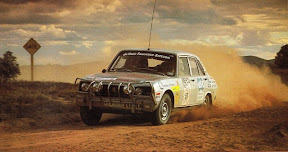 Dust hampered their run through the Kimberley stage but they were 9th by Darwin. They had a dream run to Townsville where they were placed 5th. With Carr 22 minutes behind they knew they could not match his pace down the east coast and despite a clean run they finished 6th and first private entrant. Although they placed 44th on the seeding stage, this experienced crew were quite slow on the other stages until Bordertown where they lost an hour then cut directly to Adelaide missing 6 controls. After leaving Adelaide an hour late they had a troubled run through to Blinman from where they essentially cut and ran to Perth but picked up a few controls along the way. Having missed 12 controls on that division they skipped much of the WA division from Geraldton to Port Hedland dropping a further 8 controls to Darwin. They had a better run through to Townsville, skipping only the Roper Bar stage and dropping one more control. While they skipped the horror stage north of Rockhampton, they completed the division to Sydney without missing a control and in 37th place. They completed the final division in 44th and were classified as finishing 41st with 27 controls missed. 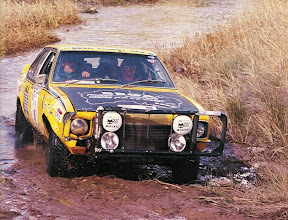 The often quick Bob Bird was 34th on the seeding stage and had a good run until they reached the Bordertown bog where they lost over 2 hours, skipping to Adelaide and missing 8 controls. They struck problems on the run to Broken Hill and subsequently headed for Perth, missing 19 controls. After Perth they went as far as Meekatharra then headed for Darwin, missing another 13 controls. They missed most o fthe division to Townsville, missing 16 controls. They completed the division to Sydney placing 18th but missed the entire last division, ultimately being classfied as finishing 82nd with 70 controls missed. This Wollongong entry placed 68th on the seeding stage and after losing an hour and half in the Bordertown bog, placed 36th into Adelaide. 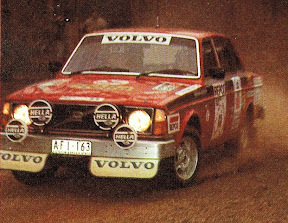 They were up to 32nd by Broken Hill but struck problems on the Blinman stage, subsequently cutting to the Nullarbor Roadhouse. 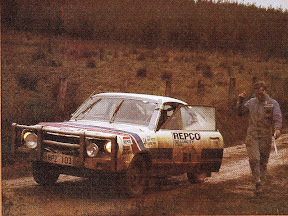 They had to retreat from the Rawlinna stage with no spares and then cut to Perth having missed 13 controls on the division. They left Perth late and rejoined on the Nunyerry horror stage and completed the division to Darwiun with 12 controls missed. After Darwin they cut to Borroloola, then did the route to Mt Isa, but then cut to Townsville, missing a further 11 controls. They had a good run down the east coast placing 10th on the division to Sydney and 16th on the final division. They were classified 54th outright with 35 controls missed. This Bega crew placed 40th on the seeding stage but lost valuable time and road position on the way to Ballarat. They then lost over an hour in the Bodertown bog and placed 35th into Adelaide. They had climbed to 28th by Immarma but despite several punctures, a slow careful run over the Nullarbor placed them 20th into Perth. 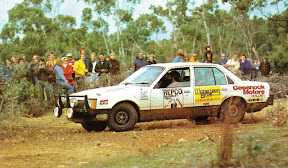 They left Perth 45 minutes later and later struck problems at Meekatharra, skipping two stages and a single control. They then continued quite strongly through to Darwin. They placed 10th on the division to Townsville and 22nd on the division to Sydney after losing more than an hour at Grafton. They placed 24th on the final division and 14th outright with just one control missed. This Newcastle entry placed a great 13th on the seeding stage then placed 18th into Adelaide after a reasonable run and limited time lost in the Bordertown bog. They had a good run through the Flinders Ranges but lost time at Marree and in the sand to Immarana where they were placed 17th. They lost time with punctures on the Nullarbor but a careful run saw them 12th into Perth. 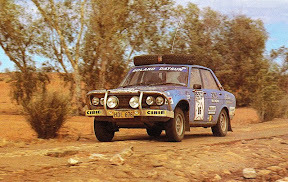 They were 45 minutes late leaving Perth and lost a further half hour at Geraldton, then perservered through to Derby where they had to miss the Kimberley stage, dropping 2 controls. They retired somewhere after Darwin. Ths Bega based entry struck trouble on the seeding stage losing 50 minutes and placing 151st. They struck more problems after Mt Gambier, then skipped to Adelaide missing 9 controls. The results suggest they were out of late time but they appear to have continued onto the next division, but where they ultimately retired remains a mystery. 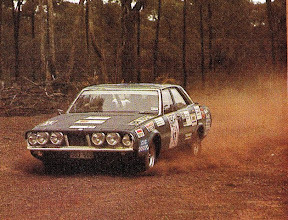 A slow run on the seeding stage by the two Mick Myers (who are unrelated) and big Mal Sinfield in 90th place and well down the field on the road. A significant time loss after Mt Gambier dropped them further and then they became inextricably bogged near Bordertown taking a maximum penalty. Another maximum on the Sunset Country saw them close to their late time limit and they had to cut directly to Adelaide missing 4 controls. They skipped most of the division to Perth, only doing the last few stages and dropping 16 controls. They did most of the route from Perth to Port Hedland but then cut to Darwin missing a further 5 controls. They only did one trail stage on the division to Townsville but picked up a few controls, missing a further 11. They were missing from the results through to Sydney but did most of the final division despite a drama around Swifts Creek where they lost more than 2 hours. They were classified as finishing 64th with 46 controls missed. Entered by the Auburn Lions club as a fundraiser, the ex-Dunkerton Marathon 504 was a well prepared car for the event. Fyvie and Harris tragically lost their lives when they crashed into a creek on the Gibb River Road. Sadly, Saville died some months after the event from cancer. Out of respect, no results were published for Car 91 so it is not possible to speculate about their progress up until the time of the accident. This was a well prepared two man crew, loosely teamed with the Hilton and Nalder Celicas. They placed 23rd on the seeding stage and carried that position through to Adelaide. 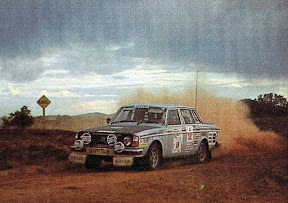 They struck some problems on the run up to Broken Hill but continued through to Immarna where they were placed they were placed 24th after losing a hour in the sand. Punctures cost them one and half hours to the Nullarbor Roadhouse but they were further delayed awaiting spares and had to skip to Kalgoorlie missing 4 or 5 controls. They had a solid run through WA placing 18th on the division to Darwin. They placed 16th on the division to Townsville despite losing more than an hour enroute to Burketown and more time at Mt Isa. They placed 32nd on the division to Sydney and 20th on the final division. They were classified 18th outright with 4 controls missed. Ellis was a quick local competitor in Victoria, but surprised many by placing 4th on the seeding stage. 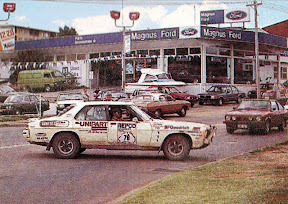 Unfortunately road position brought them undone later that night when they lost an hour in the Bordertown bog, placing them 27th at Renmark. They then struck troubles at Murray Bridge and had to cut to Adelaide, dropping 2 controls. They had a reasonable run through SA until losing more than an hour in the sand to Immarna and over 3 hours with punctures to the Nullarbor Roadhouse. They then skipped to Perth missing 11 controls. They subsequently retired somewhere in WA with broken rear suspension. This two man crew placed 77th on the seeding stage and made a slow start. They dropped two and a half hours in the Bordertown bog and almost an hour in the Sunset Country to place 66th into Adelaide. They struck trouble at Yunta and missed two controls, then lost almost an hour on the run to Frome Downs. They skipped from Blinman to Kingoonya then lost an hour in the Immarna sand and two hours with punctures to Nullarbor Roadhouse. They then skipped from Cocklebiddy to Perth missing 8 more controls. They lost quite a bit of time at Geraldton and on the next stage, but persevered through to Whim Creek where they had to cut to Darwin, missing 6 controls. On the run to Townsville they skipped the stages to Borroloola, the Norman River stage and the final stage, but missed only 2 controls. They skipped all the NSW stages missing 5 controls on the division to Sydney, then another 7 controls on the final division, cutting from Canberra to Mitta Mitta. They were classified as finishing 48th with 32 controls missed. After placing 50th on the seeding stage, this Mid North Coast crew lost time at Ballarat and then struck serious probles in the Sunset Country, cutting to Murray Bridge and missing 3 controls. Further problems after Broken Hill forced them to skip to Kingoonya then they lost over 4 hours in the Immarna sand and to Nullarbor Roadhouse, after which they skipped 10 controls to Narrogin. They missed 6 controls on the division to Darwin, skipping 6 out of the 9 trial stages. OThey dropped 14 controls on the division to Twonsville, only doing the trial stage after Mt Isa. Into more familiar territory, they placed 14th on the division to Sydney and 29th on the final division. They were classified as finishing 51st outright with 33 controls missed. This Sunshine Coast based entry paced 153rd on the seeding stage after losing almost an hour then lost more time in Mt Gambier. Poor road position probably accounted for their demise in the Bordertown big from where they cut and ran to Adelaide, missing 9 controls. The results do not show their progress through SA but they appear to have retired at Cocklebiddy on the Nullarbor. 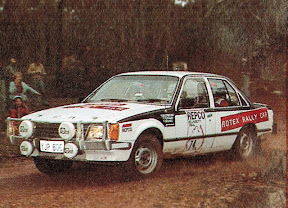 Coral Fritter (Taylor) later became an Australian Champion Co-driver (1993-95) with Neal Bates.